Why would Snack Girl mess with Thanksgiving? Come on, live a little! Actually, I don't want anyone to think about healthy eating or calories on Thanksgiving. Thanksgiving is a holiday for being with family or friends and enjoying each other. BUT, if you have a bunch of pals coming over who would like to indulge a little less - you could try this recipe. I came up with this because I LOVE pumpkin pie and I wanted to come up with a healthier version. My pumpkin pie makeover starts with not included any pastry crust. Look, a pie crust's first ingredient is BUTTER and so when you decide not to use it, you can get rid of many calories. Secondly, I am using much less sugar than a regular recipe. The key to using less sugar is to taste the recipe as you make it. Obviously, if you put in a small amount of sugar and it tastes terrible, add some more! I bet you will be surprised about the small amount of sugar you need to make the recipe work. Pumpkin is already sweet so you don't really need a lot of sugar to make it taste delicous. Finally, I used Neufchatel cheese which gives the pie a "cheesecake" type flavor. Neufchatel is almost the same texture as cream cheese, but has 30% less fat. You can find it next to the cream cheese in the dairy aisle. Make these in small ramekins so you get an instant portion size or make it in a larger pan such as a loaf pan. The size of the dish will determine how long it takes to cook. You can definitely make this a day ahead and serve it at room temperature. So how does my pie do compared to a regular pumpkin pie? There are so many different recipes that is a difficult comparison - but usually a slice of pie is about 310 calories. My version is 170 calories less! This recipe is for the people who just love the PUMPKIN part of the pumpkin pie. Remember, pumpkin is a vegetable so this dessert will give you 263% of your daily value of Vitamin A in one serving - isn't that crazy? Please let me know how it goes if you make this! I could use the feedback because I don't usually make my own pumpkin pie. Preheat oven to 350 F. Bring Neufactel cheese to room temperature either by leaving it out of the fridge or unwrapping and putting in the microwave for 30 seconds. Using a mixer, blend Neufchatel cheese in a bowl to fluff. Add pumpkin, sugar, and spice and taste. Add more sugar until you get your desired sweetness. Mix in eggs and spoon into ramekins or loaf pan. Bake for 40 minutes or until center of pie is firm. Please share your pumpkin pie replacement thoughts and/or recipes. Pumpkin cheesecake! Mmmmm. Nicely done. Yay! I love pumpkin pie, this may actually help me get through the meal! I appreciate all of the helpful hints, but may I ask that you also post fiber info. That really helps those of us who are counting WW points :) Thanks for all of the great info! @Sandy - I promise to post the fiber info. from now on - thanks so much for the suggestion. I can't eat dairy, do you think there's anything that can be substituted for the neufchatel? Maybe non dairy cream cheese? I would love to make this, thank you! I love pumpkin pies...unfortunately, my fav part of the pie is the pie crust ^^;;;;;;;;; so darn it! but oh well, this is still a great recipe! Oh yummy! I might have to try this one tonight. Or tomorrow more likely. We have pumpkins from our garden coming out of our ears and I've promised pumpkin baked goods to all my friends and family. I've been looking for a healthier pumpkin pie recipe. Thanks! @JH - go ahead and give the non-dairy cream cheese a try. I bet it will work (though I haven't tried it). Very cool and looks cheesecake like. Yum. I find that just using normal pumpkin pie instructions off of the can, minus the crust, baked in a muffin tin lined with foil cups, gives good crustless individual portions--(and I use nonfat condensed milk in it. If you eat with Trader Joe's Ginger Cats cookies or a graham cracker it's a lowfat alternative to crust. PS Pumpkins have seeds inside--like tomatoes and cucumbers and other squashes, they are fruits. Thank you Snack Girl for this post. In lieu of a cake, my seven year old son requested a homemade "low calorie pumpkin pie" for his birthday dinner next week. Voila. Your recipe arrived in time. I'll give it a try. 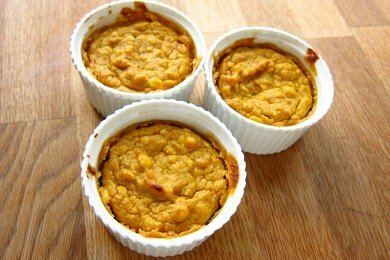 Crustless pumpkin pies are great to make for people on a gluten free diet. As long as there are no gluten containing ingredients in the filling. But if you make the traditional Libby recipe, it should be gluten free. My grandmother has been making me a small crustless pumpkin pie in a small baking dish for 15 years now, ever since I was diagnosed with celiac disease! Does this have to be fresh pumpkin or can you use canned? @Cindy - canned pumpkin will work! Thanks so much! Starting WW today so this will be on my holiday list. I did a side by side full fat pie next to a graham cracker crust skinny pie... the skinny pie won.. YUM!!! Made these over the weekend for a family dinner. I didn't have ramekins so I took a tip from Sue and baked them in foil lined muffin tins. The only thing I added was a few teaspoons of brown sugar and 1.5 tsps of vanilla extra. Big hit! fantastic! wonderful! superb! thank you so much! Summer's (yes it's Summer here, Spring only lasts a little while- our seasons are awry) too hot down here in Southern California to turn on my oven, but I LOVE, LOVE, LOVE Autumn and it's bounty from nature, specifically Pumpkin foods! so I'll have to remember this & try it when circumstances converge to allow it. Made this tonight and just loved it. I put a little Cool Whip on it and it was a big hit! Thank you. Love your site. Snack Girl, love your recipes but wonder why you don't use egg beaters or egg whites in recipes calling for eggs. I do all the time and they always turn out pretty well. I really can't think of anything that hasn't. I sometimes will go crazy and use egg beaters and then unsweetened apple sauce to replace the oil.